Zima, E. (2013): Kognition in der Interaktion. 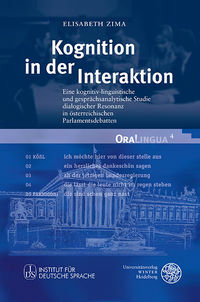 Eine kognitiv-linguistische und gesprächsanalytische Studie dialogischer Resonanz in österreichischen Parlamentsdebatten. Heidelberg: Universitätsverlag Winter. Zima, E., Weiß, C. & G. Brône. (2019). Gaze and overlap resolution in triadic interactions. Journal of Pragmatics 140, 49-69. Zima, E. (2017): Multimodal constructional resemblance. The case of English circular motion constructions. In: Ruiz de Mendoza, F., Luzondo, A., Pérez-Sobrino, P. (eds). Constructing families of constructions. Amsterdam: John Benjamins, 301-337. Nir, B. & Zima, E. (2017): Stance taking, dialogic resonance and the construction of intersubjectivity. Editorial of a Special Issue of Functions of Language 24:1, 3-15. Zima, E. (2017): Zum Konzept der Gestenresonanz in der Dialogischen Syntax. In: Breyer, T., Buchholz, M., Hamburger, A. & S. Pfänder (eds). Resonanz, Rhythmus & Synchronisierung: Erscheinungsformen und Effekte, ﻿transcript-Verlag, 177-194. Zima, E. (2013): Online semantic creativity in parliamentary debates. In: Creativity in Discourse and Arts, Eds. Veale, T., Feyaerts, K., Forceville, Ch. Berlin: Mouton de Gruyter, 139-158. Zima, E. (2013): Cognitive Grammar and Dialogic Syntax: Exploring Potential Synergies. Review of Cognitive Linguistics 11(1), 36-72. Zima, E., Brône, G. (2011): Ad hoc Konstruktionen in der Interaktion: eine korpusbasierte Studie dialogischer Resonanzherstellung. In: Konstruktionsgrammatik III: Aktuelle Fragen und Lösungsansätze. Eds. Lasch, A., Ziem, A. Tübingen. Stauffenburg, 255-273. Zima, E., Brône, G., Feyaerts, K. (2010): Patterns of interaction in Austrian parliamentary debates. The pragmasemantics of interruptive comments. In: European Parliaments under Scrutiny: Discourse strategies and interaction practices. Ed. Ilie, C. Amsterdam. John Benjamins, 135-164. Zima, E., Weiß, C. (in prep.). Multimodales Erzählen. Sammelband. Zima, E. (2017). Multimodality and Construction Grammar. Special Issue of Linguistics Vanguard, Volume 3(1). Brône, G., Zima, E. (2015). Interactional Discourse in Cognitive Linguistics. Special Issue of Language and Cognition, Volume 7(4). Zima, E., Brône, G., Feyaerts, K., Sambre, P. (2008): Resonance activation in interactional parliamentary discourse. In: Linearisation and Segmentation in Discourse. Multidisciplinary Approaches to Discourse 2008 (MAD 08), Feb 20-23 2008, Lysebu, Oslo, Norway Eds. Ramm, W., Fabricius-Hansen, C.
Zima, E. (2010): Per Linell, Rethinking Language, Mind, and World Dialogically. Interactional and Contextual Theories of Human Sense-Making. Charlotte, NC: Information Age Publishing 2009. Gesprächsforschung - Online-Zeitschrift zur verbalen Interaktion (11), 76-88. Zima, E. (2012): Oliver Ehmer. Imagination und Animation. Die Herstellung mentaler Räume durch animierte Rede. Berlin/New York: de Gruyter. Gesprächsforschung - Online-Zeitschrift zur verbalen Interaktion (13), 276-289. Zima, E. (2007). Meaning variation in interactional political discourse. Analyzing creative callouts in Austrian and French parliamentary debates. Unpublished thesis (Master of Advanced Studies). University of Leuven. Zima, E. (2006). Les politiques linguistiques en France et en Algérie - une étude comparative. Unpublished master thesis. University of Vienna.